Let's discuss one of the most quintessential and beloved of Middle Eastern food, the falafel sandwich. 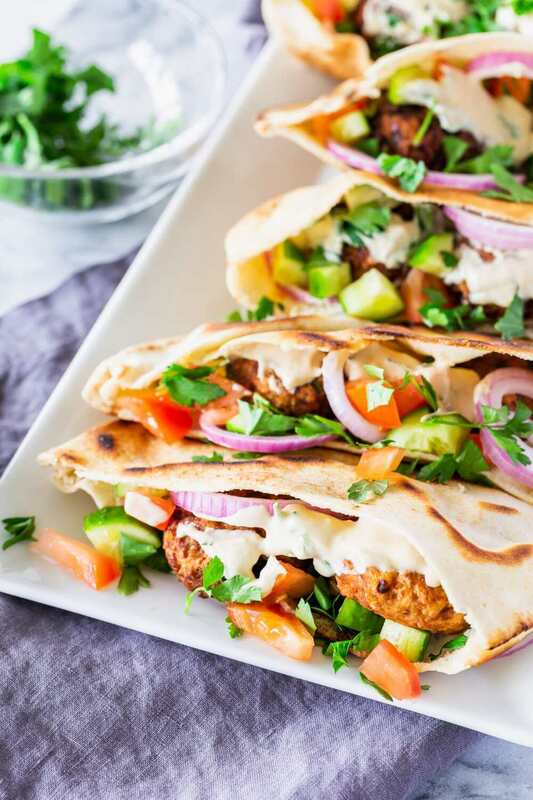 Warm pita bread, stuffed with crispy hot falafel balls, cool, crunchy diced tomatoes, diced cucumbers, sliced or diced onions, and drenched with nutty tahini sauce. In the Middle East, it shares popularity with the sabich sandwich, but in the US, it's falafel that's most closely associated with the cuisine. Its popularity means that it can be found on the menus of most Mediterranean restaurants as well as food trucks and halal street carts in major cities. The ingredients for the sandwich, such as pita bread, sesame paste for the tahini sauce and even falafel mixes are carried in most large grocery stores and supermarkets. Falafel is traditionally made from chickpeas (garbanzo beans) which makes it a filling, high fiber food. Occasionally, fava beans are used instead and then the balls of dough are fried, or even baked for a healthier recipe. It also has the advantage of being vegetarian and, actually, even vegan. Just the garbanzo beans, onions, garlic, spices, vegetables and a good drizzle of tahini sauce, made with sesame seeds and lemon juice, are all that go into this recipe. Restaurants sometimes serve falafel as a platter, over a bed of rice. But the stuffed into pita bread is the popular, easy, on the go, version. If you've never tried it, look for street carts or street fair vendors selling it and then, once you've fallen in love, try making your own. Wash and dice the tomatoes, cucumber, onion, and parsley according to the recipe and set aside. Prepare the falafel recipe from scratch or use a box of falafel mix. Heat a large frying pan or griddle to medium high heat. Spray with cooking oil or coat with about 1 tablespoon of olive oil. Heat the pita rounds for 2 minutes on each side. The pita may begin to brown a little. Stuff each pita round with the falafel, diced tomatoes, diced cucumber, sliced onion and chopped parsley. Drizzle with the tahini sauce. If making your own falafels at home, and you notice that your falafel is falling apart, add more flour, just add a little at time, until you are able to maintain a ball-shape.